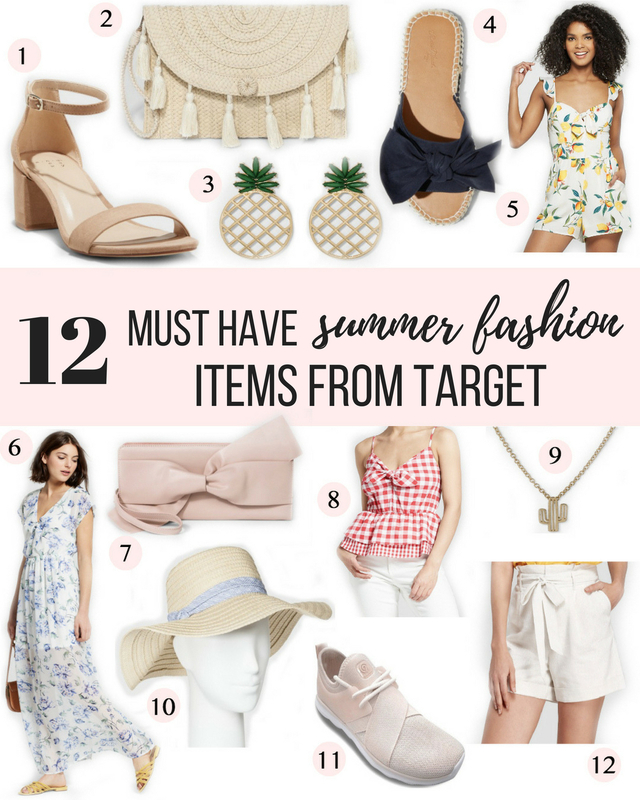 I started browsing new summer fashion from Target and after adding 10 things to my cart I realized I should be sharing these cute pieces with you before they sell out! And the good news is all clothing is 20% off until July 4th using code JULY4. You may have seen this pair of blocked heels in my June Favorites and they are number one on my list for a reason! At $25 you can’t miss these! I’ve thought about buying a backup in case anything happens to them. They’re the perfect height to wear all day and night and if you need to walk in the grass you’ll have no worries of sinking. I love this little neutral clutch with the creamy tassels! You can never go wrong with pineapple in the summertime. This trend has been around for a while and I don’t see it going anywhere anytime soon. For $12.99 these statement earrings will make any summer look. I could own 10 different bow slides and still not own enough. I love these espadrille sandals, especially in the navy! Lemon print is quickly becoming a favorite of mine and this romper with the ruffle shoulder and bow-tied front is a must-have! I live in dresses during the summertime and this light floral print is so dreamy! The soft floral print is so dreamy. I’m so drawn to anything in white and blue lately. This bow clutch would be perfect for a summer wedding or date night. You can’t go wrong with gingham printed anything. I love that this top has two different sizes and the peplum waist is so flattering! I was proposed to in Arizona, so I have a thing for cactus details! This necklace is dainty enough to be worn with anything. I don’t go to the beach or pool without a floppy hat to save my hair and skin from the sun. This one looks like the perfect amount of flop and I love the light blue tie around it. Since when did Target have cute sneakers? This blush pair looks perfect to slip on and go to all your summer activities. You may have seen me style similar bow shorts recently here on the blog. This pair is a lot more affordable and will go with anything!